Skyline Restaurant & Lounge Bar is located on the top floor of the iconic South Terrace building in Adelaide's CBD. Rated as one of the best Restaurants in Adelaide to enjoy spectacular views of the Southern Parklands and Adelaide Hills through the 360 degree glass facade. Open seven days a week for dinner. Skyline Restaurant features two Private Dining Rooms offering one of the top restaurant dining experiences in Adelaide, ideal for any private event, celebration, cocktail party or wedding. Spoil your mum this Mother’s day in Adelaide at Skyline Restaurant's signature Mother's Day Lunch. Enjoy a glass of sparkling on arrival, a delicious 3 course choice lunch, live acoustic music and stunning views for only $75.00 per person. Christmas in July in Adelaide has never been better! The culinary mastermind of our Executive Chef, has out done himself once again this year with a fantastic fresh locally sourced menu. Enjoy live music and amazing views at Adelaide's best Christmas in July event. Skyline Christmas Parties are back on Friday and Saturday nights from mid November and through December. Enjoy a 3 course meal, stunning views and dance the night away to live music from award winning Pulse Band. Packages start from only $79.00 per person. Celebrity Executive Chef Peter Milosevic comes from a background of all things food. Both his parents were chefs and this was his inspiration to start cooking from a very young age. 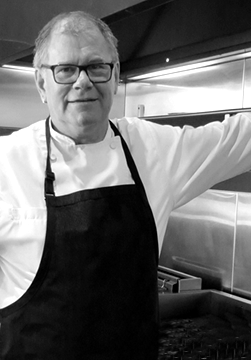 Becoming a Head Chef at only 18 years of age, he now has a wealth of over 35 years in the kitchen. His passion for food and his continuing pursuit of food knowledge is demonstrated on each plate of food he creates. Peter has earned his celebrity status from the 12 years on TV shows such as the ABC's 'Beat the Chef', Foxtel's Food Channel and Channel 7's Resident Chef on 'Discover'. Peter has travelled with the South Australian Government showcasing SA produce to the Middle East and was an early pioneer of cooking classes in the late 90's which has continued for the past 16 years. He was recently elected President of the Australian Culinary Foundation. Experience a true South Australian dining experience from one of Australia's leading chefs. Relax with a stunning sunset and panoramic views of the CBD, Adelaide Hills and surrounding parklands.